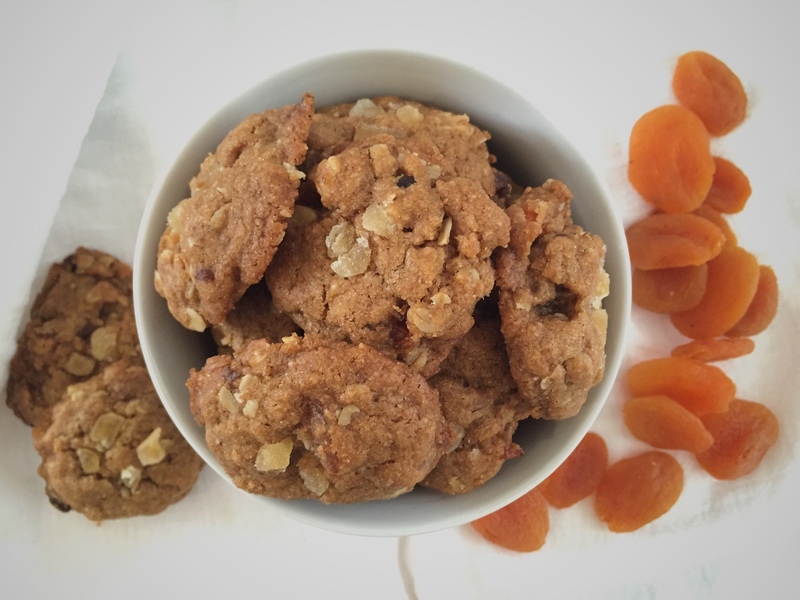 Oat-y Apricot Maple Cookies – A Healthy Pinch. The beginning of the school year, whether you are in school or not, typically signifies a rapidly waning summer and the beginning of all that we love about autumn: brightly colored, crispy leaves, slowly cooling temperatures, apple orchards abundant with produce and football Sundays. At least that’s what Illinois had to offer every year growing up. However, the separation of seasons here in Northern California seems to exist in name only. Just last week we experienced record-setting temperatures in the 100s and we’re due to hit the mid-90s again by this weekend! How is this possible? When Starbucks is advertising their Pumpkin Spice Latte, I’m still craving my iced coffee. So, in an effort to kick off the fall season, I’ve adapted my vegan chocolate chip cookie to reflect its flavors. I was inspired by a recipe in my “flourless.” cookbook which called for oats, walnuts, dried apricots and ginger. After two failed attempts making them gluten-free, this third attempt gets it right, but uses whole wheat flour. No big deal. 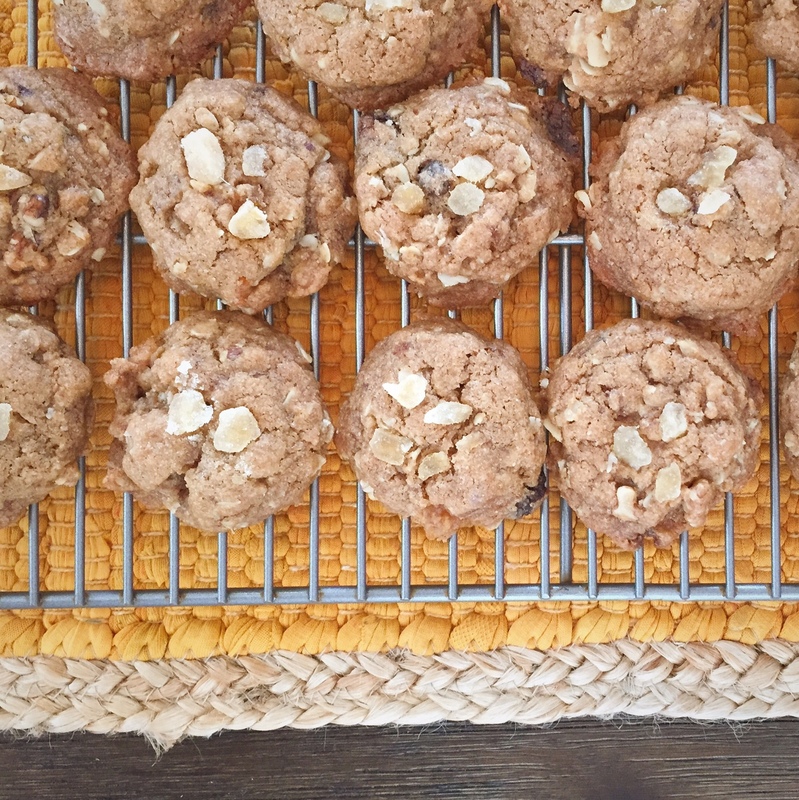 I’m extremely happy with this final batch as these cookies turned out hearty yet chewy, warmed with spices and punctuated with the subtle spice of crystallized ginger. In a large bowl, whisk together flour, baking powder, baking soda, and salt. Add the oats, chopped apricots and walnuts to the flour mixture and toss to coat. In a separate large bowl, whisk the sugars briskly with the canola oil, maple syrup and water until smooth and incorporated, about 2 minutes. If there are clumps, break them up with the back of a spoon or your hand before whisking. Cover with plastic wrap. Refrigerate the dough for at least 12 hours and up to 24 hours. Do not skip this step! Preheat the oven to 350°. Line a rimmed sheet pan with parchment paper. Remove dough from the refrigerator and use an ice cream scoop or a spoon to portion dough into 2-inch mounds. For perfectly round cookies, I take the extra step and roll them between my hands until they’re smooth dough balls. I recommend freezing the balls of dough for 5 minutes before baking so the cookies will retain their shape better in the oven.